Room a Mess? No ICE CREAM for You! Linking a reward like ice cream to a chore like a clean room can be an effective parenting tool... or not. After all, a clean room is a pretty subjective thing. Clean to a kid can mean something else entirely to the parent. Who's to judge? Just how messy is the room anyhow? What's needed is an objective referee to make the call. Enter the Walabot Mess-o-Meter! The last word in mess. The Walabot is a great sensor for detecting a mess. The Walabot Radar mode gives a terrain map of objects in the field of view, in our case, the bedroom environment. To lighting conditions - light's off won't hide the mess! But how can we detect if this is a mess? What is a mess? Objects out of place compared to where they should be. So to detect a mess we capture a radar map of a 'Clean Room' and then subtract it from the map of the current room. A perfectly clean room with nothing out of place will be completely black. Any mess will show up as a difference map which can be converted in to a single number. Now that we have an objective value for messiness we need to use it to unlock the Ice Cream. The setup is simply to point the Walabot to the floor. Originally I had hoped to be able to detect the outline of individual objects and this might be possible with more fine tuning. However the floor is quite 'bright' and lots of reflections and echo's occur in that zone. So while it can easily detect the mess, it's harder to say what the mess actually is. One of constraints for this project was to work within the Alexa Smart Home API framework. This way the Virtual Breadboard Smart Home Alexa Skill and Virtual Breadboard Smart Home Alexa Controls could be leveraged to make Alexa integration and deployment really easy. The task here is to try combine the available Alexa Smart Home building blocks in new and novel ways without having to roll and deploy a completely new Alexa Skill. Hopefully Alexa will expand on this in the future but those are the choices. Unlocking sounded most fun, a bit like unlocking levels in a game, and that constraint led to the idea of creating the Unlock ICE Cream Application. Alexa, Is Ice Cream Unlocked? The Mess device is an Alexa.Percentage Control which displays and drives a voltage level at the current percentage set by Mess. The Mess % can be manually set by sliding the level control for testing purposes. In the live application the Mess % is set programmatically by the Walabot Smart Alexa Sensor as discussed in the next section. The Theshold device is an Alexa.Percentage Control which displays and drives a voltage level at the current percentage set by Theshold. The Theshold % is set by the Parent to the level corresponding the acceptable level of mess before the Ice Cream becomes locked. 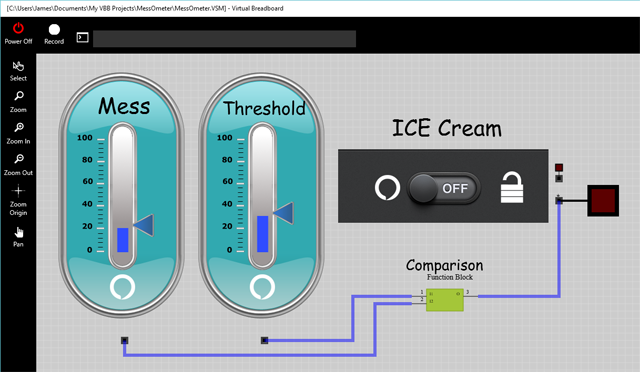 The Ice Cream device is a Lock Control and has two IO pins and an interactive Lock Slider. It supports a Lock command and the all important LockState query. Having ICE CREAM Jammed might be fun so definitely try it anyway! The Walabot SDK ships with C# reference projects. For this project the C# SensorApp_SampleCode project was used as a starting point and converted into a Smart Alexa Sensor by integrating the VirtualBreadboard.SmartHomeApi Client to send Mess data programmatically to the Mess Control. Developed as a testing tool for the Alexa Virtual Breadboard Skill it turns out to be very useful for other applications to be able to programmatically discover, connect and control Smart Home devices using the Alexa SmartHome API interfaces. With only a few lines of code it is possible to expose the VBB Alexa Controls in the running VBB Smart Home Application and programmatically control them. The Walabot is a really fun sensor. It's super sensitive but the way it detects things can take some getting used to. It's worth playing with to put in your toolbox and keep it's capabilities in mind as you design solutions to future projects.